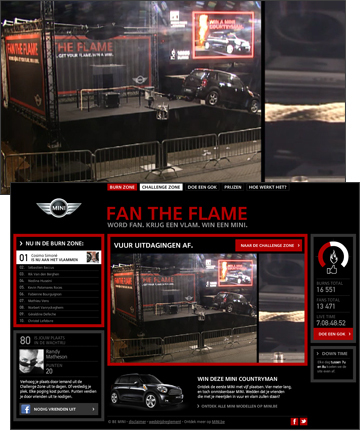 Fans of the Benelux MINI Facebook page have the opportunity to both play with fire and win a new car thanks to the ‘Fan the Flame‘ contest. A Mini Countryman has been placed on a ramp in the parking lot at the European Auto Show in Brussels. The car is held only in place on the ramp by a thick hemp rope. Facebook fans can take their turns remotely flashing a flame from an Arduino-controlled burner placed under the rope. The fan whose flame finally burns through the rope wins the car. The contest is open to anyone over 18 with a valid Belgium and Luxembourg driver’s license. The Fan the Flame contest launched on January 10 and after 9 days there have already been nearly 19,000 attempts to burn through the rope. No one likes to wait in line so MINI has turned line-jumping into part of the contest. Contestants receive points for participating and for sharing a link to the contest with friends. They can then use these points to challenge others ahead of them from positions 11-30 line ahead of them. If they can answer the challenge correctly they get to switch positions in line with the person they challenged. If they lose the challenge they lose points and remain in their position. I was able to get to the 11th position twice, but my inability to read Dutch without re-typing it into Google Translate had me pumped way back down the queue. Fan the Flame was created by the Brussels office of Agency.comTBWA. It’s not unheard of for people to return from a vacation on the ski slopes with at least one part of their body encased in plaster. 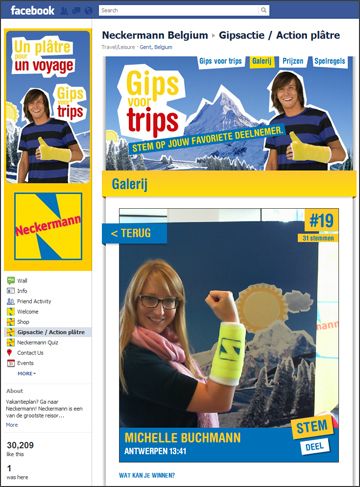 Belgian tour operator Neckermann has decided to get an early start on the season with their ‘Gips voor trips‘ (Plaster for trips) campaign. They are challenging customers to wear a plaster cast on their arm for a week and ask their friends to vote on their plaster cast picture. The person who keeps the cast on for a week and gets the most votes wins a ski vacation for 6 to Massif des Aravis in France. Last weekend 88 people made their way into the Neckermann offices in Liege and Antwerp to get their arms encased in bright yellow plaster casts (featuring a prominent Neckermann logo). After flipping through all the pictures on the Facebook page it looks like at least 2 people went a little further and had their entire head plastered, I’m sure they’re having some regrets mid way through the week. It’s a cute campaign, but I can’t help but think that one week in an arm cast is too easy. Let’s see how many of the participants could make it 30 days. As part of the ongoing ‘That Calls for a Carlsberg’ campaign Belgian ad agency Duval Guillaume Modem filled a Brussels movie theatre with 148 tough-looking tattooed bikers. They left only two available seats in the middle of the theatre for the suspicious couples to sit, and filmed the results. The reactions are priceless as the couples round the corner and come face-to-face with the intimidating crowd. Will they stay or will they run? As several blogs have pointed out this is reminiscent of the Heineken Italy viral video that won a Cannes Gold Medal Lion in 2010. In that experience, 100 women managed to convince their boyfriends and spouses to attend a classical concert rather than watch the Champions League match between Real Madrid and AC Milan. If you haven’t seen it yet, I won’t give away the great ending.